When it comes to the most exhibited project on the fairgrounds, it is also one of the easiest to exhibit. In this edition of #ShowboxSaturday, we sit down with former poultry king, Chase Fleece. Fleece is a member of the Buckeye Shooters 4-H club, and a member of the Kenton-OHP FFA Chapter. 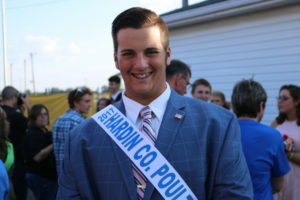 He has been showing poultry projects at the Hardin County Fair for seven years. Fleece said that first year showmen should trust in their ability to present their animal during a show. Chase also said that he encourages all members to participate in the showmanship contest to learn and experience more. Fleece said embracing that opportunity will lead future exhibitors to become a master of their craft. Chase said that beyond the basics, a simple bottle of hand sanitizer is recommended. Fleece said that hygiene is important when it comes to being at the fair and handling livestock. He said keeping a disinfectant in your show box will help cut down on the risk of becoming sick. In addition to his poultry production project, Chase has an Agricultural Communication SAE where he covers agriculture news and events for WKTN Radio. Fleece is also active in public service and athletics.